We've been wanting to bring Burger Love to Battery Park City for quite some time now, but always viewed it as The Land of Oz. This impenetrable place of tall buildings ruled by many different organizations. Little did we know that we had fans in the Land of Oz, specifically within the Battery Park City Authority (BPCA), the governing body within the Land of Oz. It's rare that the words City Official and Visionary find themselves in the same sentence, but last week, after workign with the BPCA for a couple of weeks, we got a huge glimpse of what can happen when people of vision are allowed to act. The BPCA and the Park Enforcement Police (PEP), the folks who oversee Battery Park City decided that rather than view Food Trucks as a nuisance, they would welcome them to a trial program. The BPCA & PEP not only hope that this trial program will succeed in Battery Park City but, and this is where the vision bit truly comes in, hope that it can be used as an example of how Food Trucks can be welcomed throughout the City. We are very excited to announce that starting today, every Monday, we will be located on Murray Street between West Street & North End Avenue, next to the Goldman Sachs building. We know we have a lot of Burger Lovers in the Goldman, WFC, BoNY & Stuyvesant HS buildings and are very glad that we will now be able to service all of them from a much more convenient location. This is truly exciting & revolutionary news!!! Burger Love makes things happen!!! A most exciting development last week. We got a call from the new Cooking Channel. They're apparently doing a show on the Top 10 Food Trucks in the country. The show is tentatively titled "Food Truck Revolution" and will air on August 9th. We, of course, are super flattered to be included in this. We've always known that what we were doing was mighty fine but to be acknowledged like this is very very cool. The segment is being filmed this Tuesday, May 18th at 6:30 at Greenwich St & Duane St, in front of the Food Emporium. We would love to have some of you show up. The folks from the show would like to talk to some of our fans to ask what makes our Burgers so Burgerific. To make sure that you don't go hungry during the filming, the first 30 Burger Lovers who send an email to feedme@fritesnmeats.com will get a Free Burger & Frites!! We're very excited to have you be our co-stars at this exciting event!!! Our Burger of the Week this week is The Italian Job. Thats about all friends. Hope to see you at one of our stops or at the filming. Last week many you may have heard about a little brouhaha between us and the fine gentlemen of the venerable Schnitz-mobile. We screamed, we yelled, we stomped our feet. Bascially we bahaved either like a couple of children or an old married couple, depending on how you choose to look at it. Naturally in the end we kissed and made up (without the kissing part). We apologize for airing our laundry in public, and as Oleg (the Schnitzmeister General) said "That which does not kill Burger Love & Schnitzification, only makes Burger Love & Schnitzification stronger". Well he might not have said that exact thing, but that was his sentiment ;) We've enjoyed a wonderful relationship with the Schnitzel Kings since before we started spreading Burger Love and have helped each other on many occassions. But as inevitably happens with all friends, you get into a little tiff. That's what happened between us. Who's right, who's wrong? That's irrlevant. What's important is your two favorite Trucksters are back and fully focused on the most important task at hand - bringing you the best vittles in NYC. The dessert this week continues to be the Cherry, Walnut Brioche Bread Pudding with Godiva Liquor & Vanilla Cream Sauce. You've voted with your stomachs and who are we to argue with that. WOW!!!! We had an AMAZING April!!!! Our best month so far, and of course we owe it all to you and your impecable taste in Burgers :) Thank you for showering us with Burger Love everyday, rain or shine! We truly appreciate it and promise to always keep our standards of quality and service befitting you, our Burgerific fans. 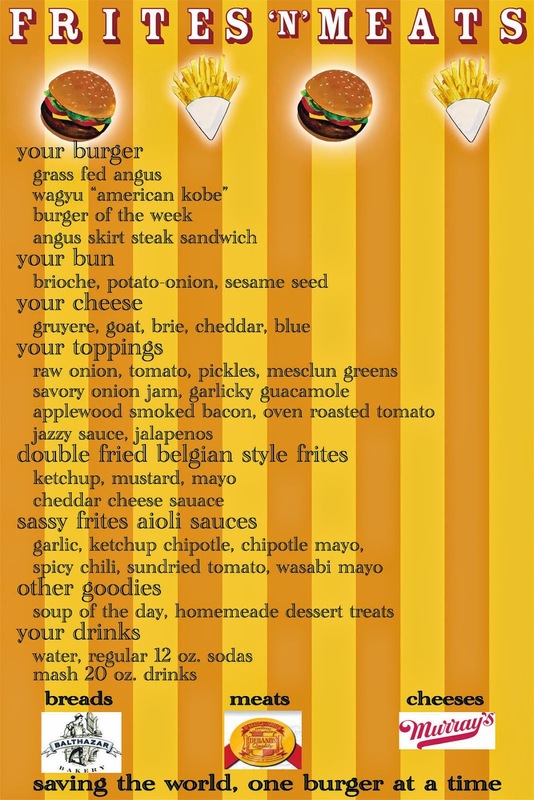 This upcoming weekend, May 8 - 9, we will be inaugurating Weekend Burger Love! Many of you have asked about it, and we had to work out some logistical issues, but now we're ready to spread Burger Love 7 days a week! We would love to get suggestions from you as to where we should go. Folks who suggest the neighborhood we pick get some free Burger Lovin'! Send your suggestions to us through Twitter at http://www.twitter.com/fritesnmeats, or via email to feedme@fritesnmeats.com or by posting them as comments here. The Vendys, the Oscars of food for the real New York, are open for nominations. Here's your chance Burger Lovers to be heard loud and strong. Just go to http://streetvendor.org/vendys/nominate and fill out the little form. Thank you very much! Before we get to the weekly schedule & Burger of the Week, we wanted to use this blog for its true intent - communicating, asking questions, voicing frustrations, just asking "Why is this like this?" There are two types of street food vendors in NYC. The old timers (guys whove been doing this for decades and park their cart in the same location everyday, and, like us, the new guys (mostly truck operators who daily move from location to location everyday). We, at Frites'N'Meats, are pretty much live and let live people. We have no interest in interfering with others, disrespecting others or foisting our beliefs or ways of doing things on others. We believe that it's not cool to go to a spot that a person has occupied everyday for years and essentially force them out for your benefit, but we do not think that just because you occupy a certain spot one day a week that you somehow "own" that spot the other days that youre not there. We do not believe that anyone who parks in a space one day a week, has the right to demand that someone who is there on a day they are not, leave that spot because they feel that their day no longer works and want to use your day. I know that sounds a little confusing, so let me provide an example without using names. We used to park on Water & Broad in FiDi on Mondays, while another truck parked there Tuesdays. Then one day, due to their decreasing sales, the owner of the other truck came to us and said "I have to change my spots around. I want to be in that spot on Monday, you have to leave!" They then proceeded to tell us that they had the right to kick us out since they "owned" that spot because they had been coming there one day a week for 6 months. We told them that that didn't seem right as these are public streets and anyone is allowed to be there. Our reasonable comments upset this vendor greatly who then proceeded to start shouting and threatening to physically assault us. We understand that business is business, but making violent threats as well as claiming "ownership" of something that is clearly public and does not belong to anyone but the city is a bit over the top. This is especially difficult to comprehend since when we thought of parking on Water & Broad we informed this particular vendor that we would be doing that. At that time they had no issue with that, nor did they make any conditions on our being able to do so. The Burger of the Week this week is the El Cubano! And least but definitely not least, our Weekly Twitter Free Lunch Winner is Doug Cordes!!! Have a great week everyone,and make sure to make it better with some Burger Love!! !